Phoenix, AZ—In 1992/1993 Melanie Bernas, 17 and Angela Brosso, 22 were savagely sliced up nearly a year apart in the same general vicinity. In November, 1992 the Brosso girl went for a bicycle ride and never returned. Her live-in boyfriend reported her missing to police. Brosso was soon found headless and her torso cut in half in a nearby park at 25th Avenue and Cactus. I saw raw video of the body captured by a TV news photographer and it was indeed hideous. That video was heavily edited before it hit the airwaves. 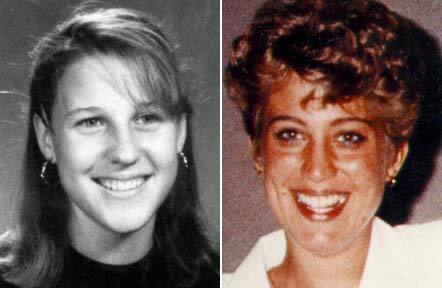 Police believe that both young women were murdered by the same person. Police have a DNA material believed left by the killer but they’ve not found a suspect for a match yet. These two crimes have left an impression on me for nearly 20 years. There is no statute of limitations for murder and this killer needs to be punished. I can’t believe that this savage predator has not killed more young women. This killer is right out of a horror movie. We can only hope these two murders can be solved. I will lay you money since the DNA cannot be matched up to any known DNA that the offender in these two murders was an illegal alien who is back in Mexico living a free life. Shaved, you may be on the money here. During this period there was a Mexican illegal alien, serial killer using our freight train system to move around. He left bodies wherever he went. I forgot his M.O. or why or even if he was ever ruled out. I too suspect the killer is in Mexico or some prison for similar crimes. But who knows for sure. Maybe his luck will run out. Mexico will never extradite a Mexican killer to the USA because of the death penalty. Since a blade was used I vote for illegal beano.